I like to read headstones: you can learn a lot from headstones, can’t you? I used to have to go up winter, summer, rain and snow with my Gran and my Aunty Annie Boothwaite and take these damn flowers. I used to have to go and get the water and take it back. Any flowers left over after family graves had been decorated would be placed on the unknown grave. The ground wasn’t consecrated where he was. I think they found him on the railway line. The Boys’ Brigade or someone from Chapel made a wooden cross for it and there was a jam jar and I used to go and put my little bits and pieces in it. It was just a mound of earth. I can’t be one hundred percent certain, but I think they found him on the railway line…. I went into the old cemetery as well and I think the last person to be buried there was Old Lady Smith who used to go into The Forrester’s with my Gran. It could have been 1950; she was the mother of Frank Smith the Parish Clerk. I can remember walking down behind the coffin. I was being nosey; I was a kid, I just tagged along. I think if the hedges had been cut it would have been better, but it wasn’t and there was all weeds growing up. If you’ve got to go, you might as well go where it’s nice! But in her own case; weeds or a lack of them will be purely academic. Joan Millband has decided to donate her body to the University of Nottingham School for Biomedical Science. It will cost £90 instead of £3,000 for a funeral and she will be collected from home in a van, two or three days after her death. Joan’s great grandfather, James was born in 1856, in Duddleston near Birmingham, the son of William Bailey and Anne Glaves. William was a jobbing basket maker and we know that Anne was illiterate because she made her mark on her son’s birth certificate in place of a signature. Railway plant layer James, married Elizabeth from Breaston and they became parents to 9 children born in Reader Street, Spondon and Annie, who made her entrance in Ockbrook. Aunt Randa, Aunt Bertha, Aunt Annie, and Uncle John – I don’t remember an Edward — I’m not very good at remembering people. Another son was a casualty of the First World War and appears to have been erased from family memory thereafter. Joan stumbled upon William’s existence purely by chance after the death of her own father in 1987. One snippet had surfaced years earlier, when she prevented her grandmother from discarding a small condolence card edged in black and inscribed with the words: In loving memory of Private W. Bailey. As she sorted out her father’s possessions after his death; Joan discovered a commemorative medal belonging to Private W Bailey 4072, 7th Lancers. William Bailey had joined the Royal Warwickshire regiment on his enlistment, but the battalion suffered heavy casualties and by the time of his death in April 1918, the troop had amalgamated with the Lancers. Joan’s mother; Annie Pye was the daughter of Arthur Proctor Pye and Susan Goodhead. Susan died when her granddaughter was about eighteen months old and Joan has no memories of her at all. Arthur was a French polisher; a skilled craftsman, who specialised in creating a very high gloss finish on figured wood. He was employed by Porter’s furniture shop in Derby and after the death of his wife, moved in with Annie and her family. 19, Victoria Avenue in Borrowash was a two up, two down private rental with a ‘hut – plus – sink’ in the outside yard deputising for a kitchen, and an outside toilet. My mum’s dad lived with us and he used to go fishing and he always brought the fish home but in water. He used to put them in the cistern of the loo and you’d go to the loo to spend a penny and what would happen? You’d get splashed. They were in a bucket – live silver coloured ones and then in the toilet cistern. He could have killed them and we couldn’t have had them for a meal, couldn’t we? Granddad said to Mum ‘I’ll take her out’ and she says ‘All right,’ and he took me to the greyhound racing up Friar Gate! Mum says when we got back ‘Ooh, where have you been?’ and I said ‘Oh, we’ve been to the dogs!’ You had to scrape Mother off the ceiling. And Granddad off the ceiling! Well – he should have warned me not to say anything, shouldn’t he? We went on the train from Borrowash. It was the first time I’d been on a train so it would have been a fun ride for me. The porter on the train was also called Joan and she came from Newbold Avenue. It was ‘Hello Joan’. ‘Hello Joan’. You know? But we didn’t come back on it. He lost his money so we had to walk! After seven years and prompted by a family quarrel involving his other children Harry and Nelly; Arthur left Annie’s household never to return. Joan and her parents heard nothing – until Annie found out by chance that he had died by reading an obituary in the local paper. I was horrified and hurt on behalf of Mum and I’ve no desire to see them. When Mum died I got my own back and didn’t tell them about it either. I was loyal to my Mum…. She said they had to be at the top of the house and in the morning you had to get down and make the fires and everything before everybody else got up. It was a house on Long Row. I never went, but I know where Long Row was- those great big Victorian houses – bay windows and all the lot! Posh. She learned to be tough early on in her life. My Dad used to tell me that on a Sunday, when it was a nice day, they used to get a pony and trap and go to Ticknall in it! You couldn’t do that today! Not safely anyway! Thomas worked in the Acid Department at British Celanese and came home smelling something awful! Walked a bull from Elvaston to Derby Market, leading it on a pole with a ring through its nose. For a while; Adela, Thomas and their young sons Robert and Charlie lived in a rented cottage on the Harrington estate. He earned more opening that gate in a week than Granddad did in wages! Adela bestrode the stage as a colourful presence in Joan’s childhood. So we never did it after that. We just watched the planes come over; she’d have the curtains open so you could see them come over, you know. I used to go in the Forrester’s in the Jug and Bottle with my Grandma, because she went in every night and sometimes with Old Lady Smith. She had a bottle of John Bull and then she’d take a pint of mild home in a jug and she always said that if she broke the jug she wouldn’t go again. I used to go in with her and it was Mr Francis and there was a little tiny pint pot he had hanging on the door jar. He’d fill it for me and give it me and when I drank the first one, I used to say ‘More please’. It was when I was between five and ten. Adela was unsentimental and practical – qualities that came to the fore when her husband; Joan’s grandfather, died in sudden and tragic circumstances. Dad and Uncle Charlie were waiting at the bus stop outside Burrow’s fish and chip shop on Victoria Avenue. They were waiting to catch a bus to go to work at Spondon Power Station. Thomas was taken to hospital and died shortly afterwards. We all went to the crematorium and we came back and she’d got a bit of sandwiches and things you know. I sat on the sideboard. I always had to sit on the drawer. It was there and I had to pull it out and sit on it, because that was my place at the table. So – I’m sitting here and she’s sitting there which was her place and she starts to tell us all funny things and make us laugh. She told us about the man she once went to lay out! She put her hand on his tummy and the dead man made a noise and the man who was with her shot off and left her! The accident was in the paper and the chap who came to interview Gran – he was made up – eye shadow on and all! And when he’d gone, Gran looked at me and says ‘I don’t know why we talked to him, do you? Or words to that effect! 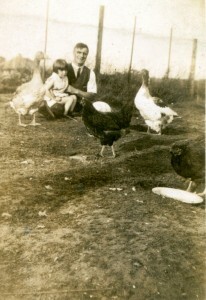 Joan’s childhood in Borrowash was populated with local ‘characters’ like Mrs Dawson (a little woman, as fat as she was round), Mrs Jackson (she didn’t like me because I cheeked her and she picked on me) and Old Man Bradbury (he used to keep his horse in that field where those houses are built). Dr Smith, the local doctor, lived in a very nice house and he had a goldfish pool outside with goldfish in. I had to go for my injection; I don’t know what for – measles or something. He had an ornament on his mantelpiece in the surgery and there was a gas fire and he had a little gas ring that he put a saucepan of water on and put the needle in it. He said, when he was going to stick the needle in, that if I watched those ornaments that he had got; cows and horses and sheep – those that were standing up would sit down or lie down and the ones that were lying down would stand up. And do you know, they didn’t! It was a good distraction technique althoughI never forgave him for that! Mrs Dawson was a wheeler-dealer type and she’d go to jumble sales and pick things up and sell them. Well she’d got this red dress and my Mum bought it and made me wear it. I hated it. It’d got black and white – well, they looked like elephants to me – and I hated it! I still don’t like red. Mum thought she was doing the right thing in getting it because we hadn’t got any coupons. Haddock’s had got a smell all its own. I can’t describe that smell. It wasn’t clean and it wasn’t dirty. It had a wooden floor but it never seemed as if it had been brushed or cleaned; he was an old man…. The Larkins took it over after him. We used to play in Elm Street – we played rounders, ‘kick can lurky’ – you had a can and you kicked it and you all ran off! I used to have (I’ve still got it); a big button and you’d put a string through; peg it on somebody’s window; tie them together, pull it and run! I had a whip and a top and skates and a skipping rope and a ball. Presents at Christmas were usually whatever was available at the time; perhaps a comb or something like that. I had a stocking and I always got a shiny penny put in it and an apple or an orange. I don’t think I ever went without anything, or perhaps I didn’t notice. I remember one Christmas I got a little dinky car; it was somebody else’s. It was second hand when I got it. Chad Valley had cornered the market in toys because of the war – time ban on German manufacturers. There was a shop in Charnwood Road in Derby and there was this shop – and the man sold prams. She said ‘You can’t because we can’t afford it,’ but I got them both and I’ve got them still! The bigger one of the two is called Lucille and the other one has got ginger hair, so she’s called Ginger. I remember getting on the trolley bus in Derby with this big doll wrapped in a shawl. The bus was full and I was standing holding it and somebody got up to let me sit down because they thought it was a baby! There was a blast wall in front of the school door and you had to go right up to the end to go to the loo. It was a bit cold in winter, and when you went in the door there was the cloakroom. You hung your coats up and you went in – there was a wood burner and there was a curtain half way through so it was split into two classrooms. I sat in the cloakroom and I wouldn’t go into the classroom and Miss Johns the headmistress came to get me. I wouldn’t move. I grabbed hold of the peg and I kicked her; so they sent for my Mum! Years later, she acknowledges that it was quite a nice school. Some people did learn. She was a don at Oxford – and they’d only grown up in the village like I had! They lived down Manor Road and my Dad used to take me to see John because my Dad and John’s Dad were friends. We used to go down the bottom of the garden; get in a little row boat and go up and down on the canal. It’s silly isn’t it? I’d forgotten all that. I wouldn’t take it. Miss Johns couldn’t make me. 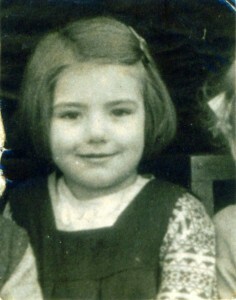 and Joan found herself enrolled as a pupil at the fee paying St Philomena’s Convent School inDerby. He was off work with sciatica so I had to leave. I didn’t want to – I just did it and tried not to think about it. Plans were hastily re-arranged and Joan secured a job at the Co-op in Derby’s Burton Road; followed by a transfer to the Spondon village branch. At eighteen; she was beginning to mount the career ladder as Manageress of the Sitwell Street Co-op Confectionary Section – but then she met Brian Millband. Joan’s future husband worked at the Co-op Coal Depot and the couple married when Joan was 22. She left her job to concentrate upon being Mrs Millband. He was working in the Derby Post Office then. One day, he just came home from work; went straight upstairs and came down again with a packed bag. He ran off with another woman. It might have been better if Brian had run off. What he did was to run back and forth, making it impossible for Joan to re-build her life. I eventually told him that if you think you’re coming back again, you can just come as a lodger and pay your way! In fact, Joan experienced five wretched years of constant worry, tension and distress, culminating in Brian dying on the very day that her divorce came into court. He was back with the other woman and they had a caravan at the side of the house. He went into it; lit a cigarette and the whole thing went blast off! There was a gas explosion; it just blew up and that was that. I never knew whether or not it was an accident or if he had carried out his threat to commit suicide, I just don’t know. Once thing was certain – and that was that the difficulties caused by Brian were not over. I’d got no desire to pick up any man’s socks ever again? Why on earth should I? Brian and I met them in the ‘60s on holiday. I’ve researched it all – they want complete bodies at the Centre – you’re no use to them if you’ve had a post mortem… and then, when they’ve finished, you have to tell them if you want your remaining bits buried or cremated. I don’t mind – and I won’t know about it anyway! I like to think I’ll be of some use to student doctors learning about bodies so they can cure diseases. And – I think it might catch on anyway! The people over the road were very interested when I told them. They didn’t know you could do that. They might make enquires and set it up themselves for when they go. You never know, do you? Helen Clark would like to thank Alice Beilby for the transcription; Paul Hart and Anthony Heron for the original interviews and Joan Millband for her time and patience. 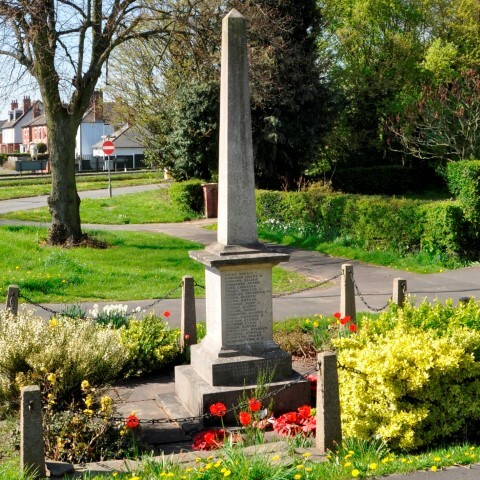 I am looking for the grave of a child by the name of Peter Harrison,born,died and buried in 1951 in a cemetery in Borrowash. I am in the process of family history research for the Harrison family,who would like to visit the grave if only they knew where it was.